I am the middle child of five. I have three sisters, squished between two older and one younger, along with a younger brother. I was born and raised in San Francisco, California until I was nine when my family moved across the Bay Bridge to the island city of Alameda, all the while going to the UCSF Pediatric CF Clinic. I left California for college and ended up in Nashville, Tennessee (to make life miserable for my parents, my older sisters were attending college in Boston and Miami at that time) for four years, attending Vanderbilt University and their CF clinic on campus. After college, I was accepted into the teaching fellowship, Teach For America and taught third grade at a public charter school in San Jose, California. I spent two years in the classroom and experienced a large enough dip in health that my CF Clinic at Stanford recommended I step away from the classroom. By complete accident, I ended up in the Silicon Valley ‘tech” scene (going on almost four years now) starting as a Sales Development Rep and eventually working my way to an Account Executive role. My biggest passion is fitness, specifically Ultimate Frisbee, but I love a good game of basketball, swimming, biking (including the CF Cycle for Life rides), and surfing. I have traveled across much of the United States including Hawaii and Alaska and abroad to Israel, Cuba, Egypt, Costa Rica, and Peru. Growing up, I wanted to be just another one of the kids at home, school, and at the pool. That was motivation enough to do what I needed to get out and PLAY. To this day, this thought along with my competitive nature still drives me. I never viewed CF as an excuse or as a hindrance to accomplish my dreams/goals. If anyone else can do it, then I can do it. 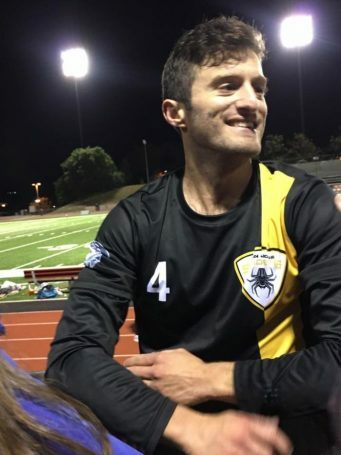 Growing up, I wanted to become a professional athlete and I feel lucky enough to say I have accomplished that feat as a Handler on the San Jose Spiders Ultimate Frisbee Team. In addition to all of this, helping others achieve their fitness goals has become the most recent motivation for me. I am currently working on getting my personal training license. When I was 14, I had the opportunity to train with a personal trainer and that experience was life-changing as it grew not only my personal strength but my self-confidence. Enjoyment. Overall health. Addiction. While I know that exercise is critical to me as a person living with CF, I truly LOVE working out. My ideal weekend is to get the guys together for 2-3 hours of competitive basketball, wake up the next morning to surf for a couple hours, with some Ultimate Frisbee practice to look forward to later in the day. There always has to be a goal, something to reach for, to achieve. It makes me fight harder. What work out tips would you give to someone else with CF? Find what you love athletically and do it. Do it a lot. Obsess over it. Try your best not to skip treatments, however, keeping your lungs clear through regular vigorous exercise gives you an occasional pass when you’re just too tired or rushed to get it all in. While I have looked up to various individuals throughout my life, such as my parents, grandparents, teachers, and coaches, my idea of a role model has taken shape as more of a general appreciation for those that live life in a way that exemplifies what I feel to be most important: kindness, fitness-inspired, and humor-oriented individuals. I naturally find myself admiring those people who don’t take themselves too seriously and live life with full abandon and joy. We all, CF or not, have one life so we have to make the most of it.